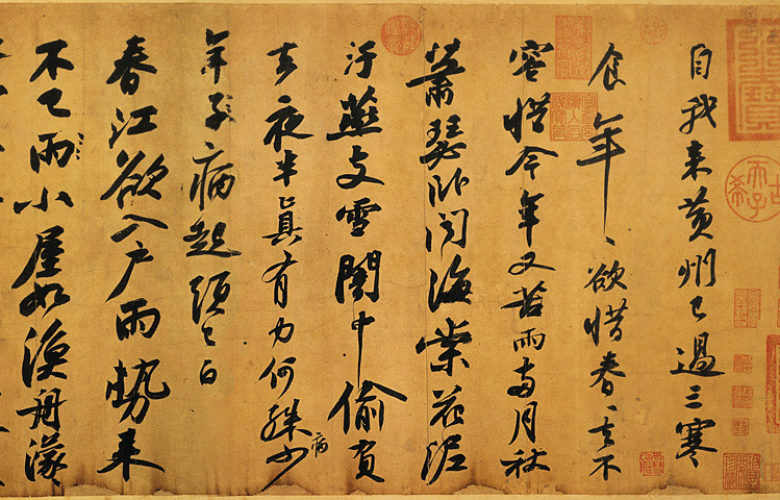 This piece represents two poems that Su Shi wrote during his exile to Huangzhou in 1082. It was transcribed into a work of calligraphy sometime thereafter. Despite Su’s upbeat character, the poetry has an air of dejection to it. The characters and the distance between them, for example, seem to vary rhythmically according to the emotional content. In terms of semi-cursive script, the size of the characters here ranges considerably. Su Shi once said of his own calligraphy that it is “everything from short to long, plump to bony (短長肥脊各有態).” Here, the size of the characters is sometimes reserved, other times bold. Characters that particularly stand out include those in lines 2 (年), 5 (中), 11 (葦), and 13 (紙) from the right, where their last vertical stroke trails down for some distance to stand out against the blank paper. The variation in the thickness of and distance between the lines as well as the size of the characters help to give this work a uniquely individual quality. In fact, Su Shi’s calligraphy represents one of the more personal styles of the period. Furthermore, another great Song calligrapher, Huang Tingjian (黃庭堅, 1045–1105), wrote a colophon for this work sometime before the ninth lunar month of 1100. The sizes of the characters in Huang’s colophon are even larger than Su’s, creating an ideal complement to this masterpiece of calligraphy.